The Pyramid Electric building on the corner of 31st and West Oxford Streets in Brewerytown, shown here during its rehabilitation, was converted into loft apartments in 2016. Developers received $200,000 in state historic preservation tax credits for the project. 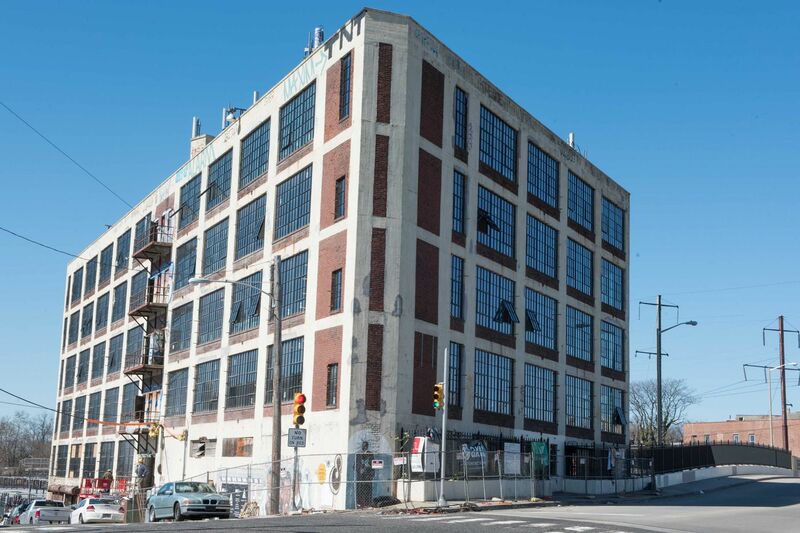 When developer David Waxman converted the old Pyramid Electric building in North Philadelphia into loft apartments in 2016, he asked the state for a historic preservation tax credit to help fund the project. The distinctive building in the city’s Brewerytown neighborhood was built in 1922 as a furniture warehouse and later used for 39 years by the electric supply company. It had sat vacant since 2000 and was eligible for the tax relief because its new owners planned to rehab it and preserve its historic character. Waxman’s company, MM Partners, received $200,000 in credits from the state for the Pyramid Lofts project, winning the tax break in the lottery system run by the program. Waxman appreciated the help, but it wasn’t going to make or break the $12 million project. “It’s a gift, but it’s after the fact,” he said. That’s a common experience for those who have applied for state tax credits in Pennsylvania, according to a review of the program by the state’s Independent Fiscal Office. The agency suggested that the tax credit, capped at $3 million per year, is too small to incentivize large preservation projects. Changes to the program, including a larger dollar cap, could better assist preservation projects and bring economic and cultural benefits to the state, its report stated. Lawmakers are responding; bills will soon be introduced in the Pennsylvania Senate and House to raise the cap on the credits to $30 million per year and extend for another decade the program that was passed by the legislature in 2012 and is set to expire in 2020. “It’s one of those government programs that makes sense in terms of eliminating blight, in terms of restoring pride to a community,” said Sen. David Argall (R., Schuylkill), who said he plans to sponsor a bill to extend and expand the credit. Argall’s bill would increase the per-project cap to $2.5 million. That’s five times the current per-project cap of $500,000 — although the highest award that has been given to any one project is $250,000. Argall and preservation advocates hope the changes help the program better accomplish its goal of encouraging developers to refurbish buildings that would otherwise sit vacant or face demolition. Under the current program, 66 projects were approved as eligible for the tax credits in the last fiscal year; only 21 actually got them before funding ran out. “We don’t think it’s enough to move the needle on large projects," Matthew Knittel, director of the Independent Fiscal Office, said at a hearing in Harrisburg last month. To qualify for credits, buildings undergoing rehabilitation must be on the National Register of Historic Places or in a district listed in the national register. Currently, tax credits must be spread among regions of the state and are awarded through a lottery, which means developers can’t count on the credit even if they have a highly qualified project. Recommendations in the report released last month by the fiscal office — the state agency tasked with reviewing tax-credit programs — include using a scoring system for awarding credits, and establishing a schedule for annual award announcements. Since the 2015-16 fiscal year, 15 projects in Southeastern Pennsylvania have received state historic tax credit awards; all are in Philadelphia with the exception of an old armory building that was refurbished into the Knauer Performing Arts Center in West Chester and one project in Lancaster. The Uptown! Knauer Performing Arts Center in West Chester received a state historic preservation tax credit to refurbish an armory building into a theater. It opened in 2017. “Because the size of the credit and the difficulty in applying and the smallish likelihood that they’ll be approved … [some developers] don’t even bother going for the state credit,” said Paul Steinke, executive director of the Preservation Alliance for Greater Philadelphia. Other states offer more credits; of the 32 that have some form of a preservation credit program, 13 have no cap on awards. New Jersey has no state credit, but Gov. Phil Murphy has voiced support for creating one. The Legislature passed a plan establishing historic preservation tax credits in 2011 but Gov. Chris Christie vetoed it. While states forgo future tax revenue to offer the credits, advocates note long-term economic development benefits such as reducing blight and the number of abandoned buildings. The Independent Fiscal Office report noted that it is difficult to evaluate economic impact of the tax credit and that there are also noneconomic impacts and “positive spillover effects” for communities. “If you look at other states that have state programs that are meaningful, you’ve seen an unbelievable volume of historic buildings renovated,” Waxman said, citing Richmond, Va., a city in one of the states that has no cap on the annual amount that can be awarded in credits. Developers who receive state preservation tax credits typically also receive federal tax credits on their projects. The federal credit offers larger awards, but developers say recent changes to that program have minimized the credit’s value. “Enhancing the state credit could help make up for that,” Steinke said. Andrea Lowery, executive director of the Pennsylvania Historical & Museum Commission, which reviews tax credit applications, said at a hearing last month that her office agreed with the recommendation to expand the credit. She also highlighted the benefits of a strong preservation tax credit program. “There’s the halo effect in terms of projects spurring other projects in the neighborhood and raising property values,” Lowery said.